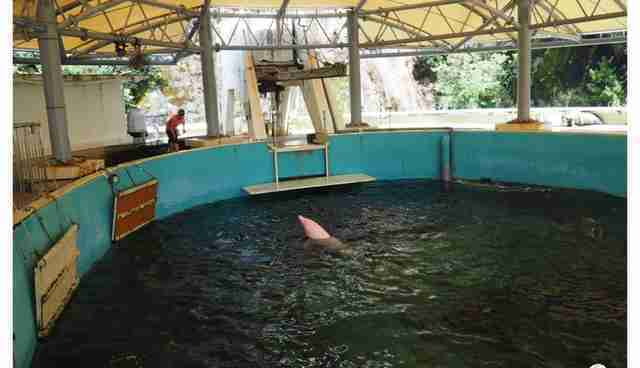 "Angel and the dolphins in the same tank are in some of the worst conditions I've ever seen for captive dolphins." Two years, 8 months and 26 days. 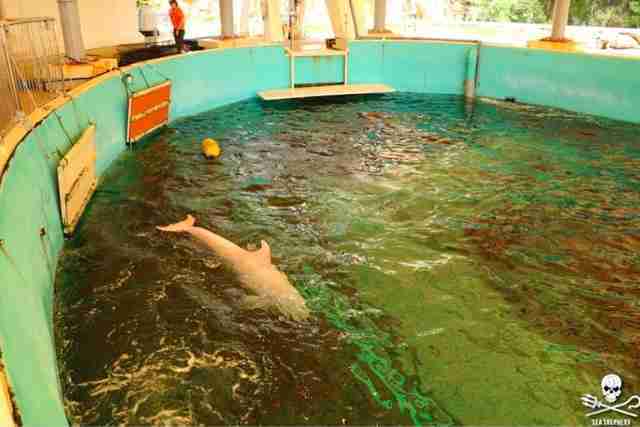 That's how long Angel, a rare albino bottlenose dolphin, has been kept in captivity. When you see how dirty her tank is, it's amazing that she's still alive. Angel lives in deplorable conditions at the Taiji Whale Museum in Taiji, Japan. 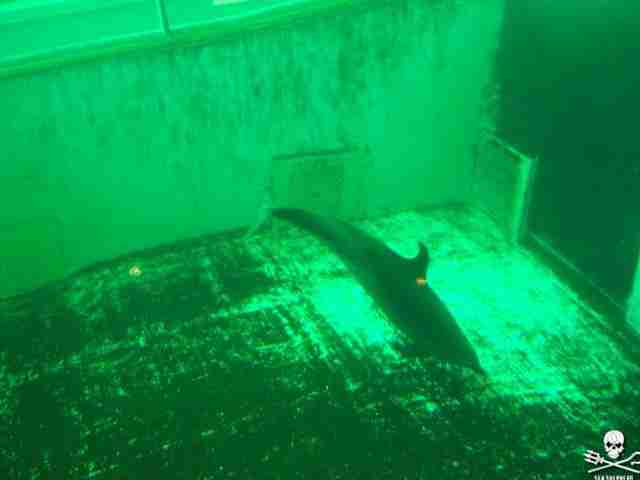 Her tiny, oval-shaped tank is just 20 feet deep, and 30 by 40 feet wide. And it's filthy - absolutely filthy. "Yes, it is as bad as it looks," Captain Jessie Treverton of Sea Shepherd Conservation Society, which has been monitoring Angel's condition, told The Dodo. "The photos and video show the black sides, and the bottom of the tank and the water are filthy." Sea Shepherd has volunteers on the ground in Taiji for the fourteenth year to document the atrocities of the city's annual dolphin hunt. 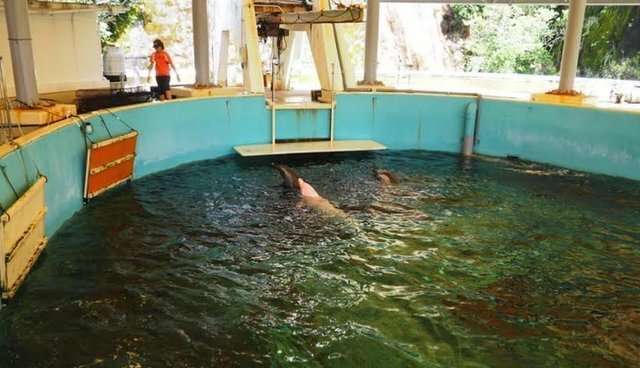 Graham Henry, a campaign coordinator for Sea Shepherd, was in Taiji last year, and said he can't believe how bad Angel's tank has become over the past 12 months. "The tank, according to the footage I've seen this year, is definitely filthier than what I witnessed in person last year," Henry told The Dodo. 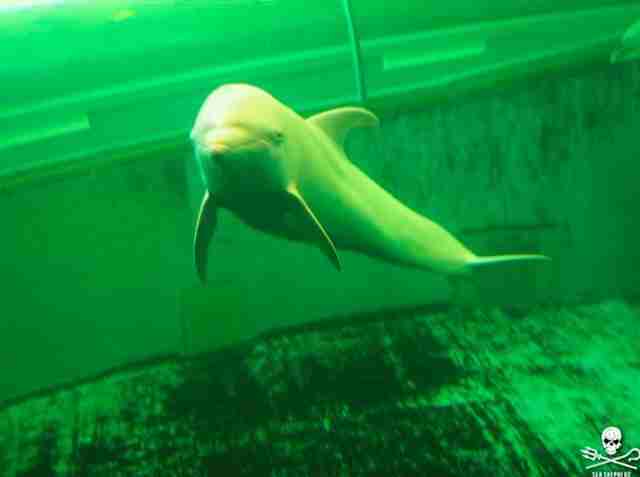 "Angel and the dolphins in the same tank are in some of the worst conditions I've ever seen for captive dolphins." 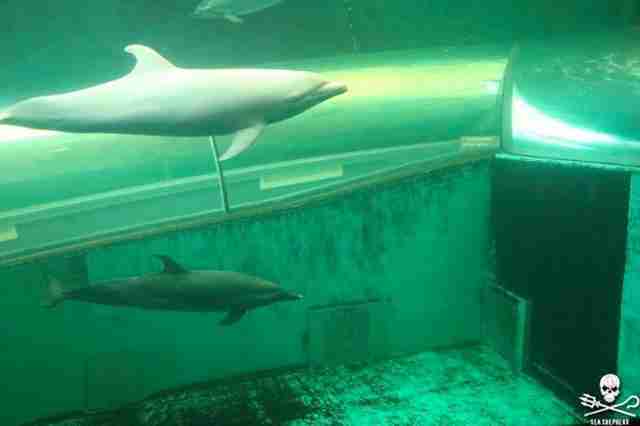 As if that wasn't bad enough, the top of the tank is covered by a roof, which means that the dolphins have no access to sunlight. 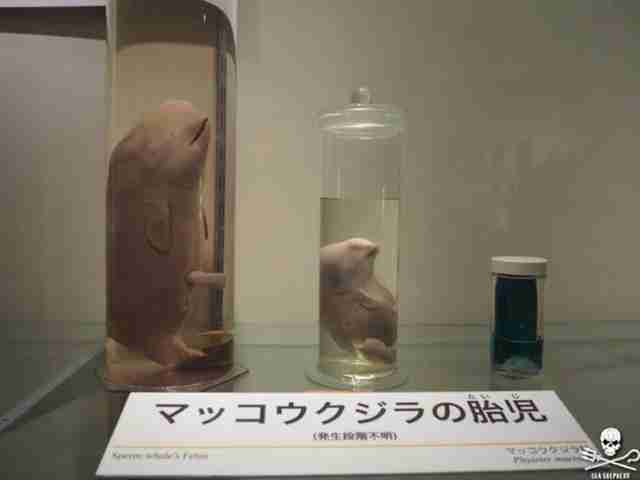 The dolphins also have to put up with the loud music and voiceovers constantly being piped through the loudspeakers in the so-called museum. "This must be torturous for the dolphins' highly tuned senses," Treverton said. Angel's tank is also filled with chlorinated water, which is known to cause eye infections and other medical issues for cetaceans. "Angel keeps her eyes shut most of the time," Treverton said. "Maybe because the water stings them." There are currently six more dolphins in the tank with Angel - one other bottlenose dolphin, two striped dolphins and three pantropical dolphins. In a video, the dolphins swim in frantic circles, surfacing every few minutes - or even seconds - for gulps of air. Angel was only a calf when Japanese fishermen hunted her and her family from the Pacific Ocean, driving them into the notorious killing cove in Taiji, Japan. The fishermen capture the dolphins by hitting hammers against metal poles on their boats, creating a deafening wall of sound that interrupts the dolphins' sonar and traps them. Once the dolphins were rounded up, the prettiest ones were sold to aquariums and swim-with-dolphin programs around the world. 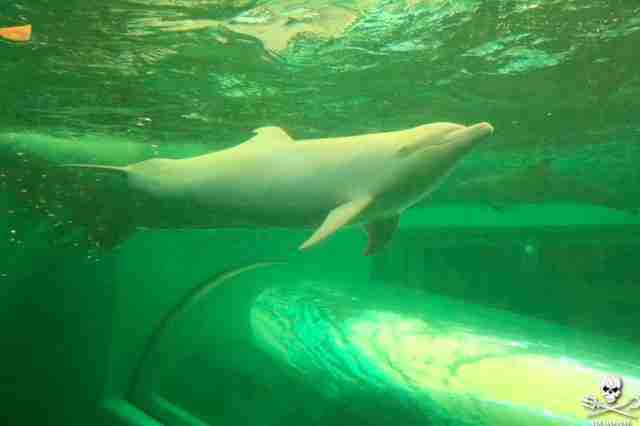 Angel - being a rare albino dolphin - was ripped away from her mother and put on display in the Taiji Whale Museum, a "museum" that displays both dead and living cetaceans, as well as whaling paraphernalia. The dolphins not sold into captivity were brutally murdered, right in front of their families, and sold as meat to individuals, hospitals and schools. 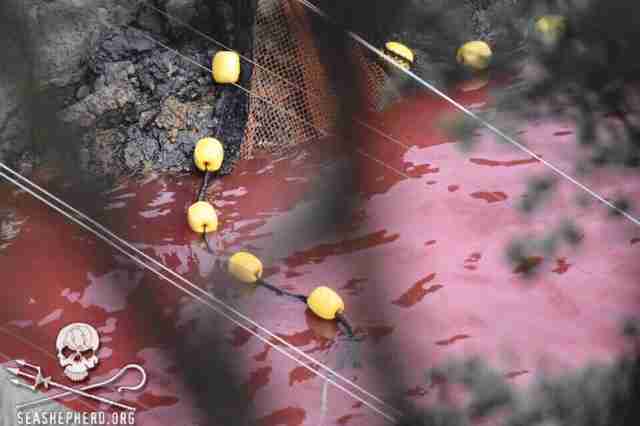 This isn't something that happened once - this cruel cycle of murder and captivity happens every year in Taiji, Japan, where the waters literally run red with blood during the annual hunt, which is ongoing right now. 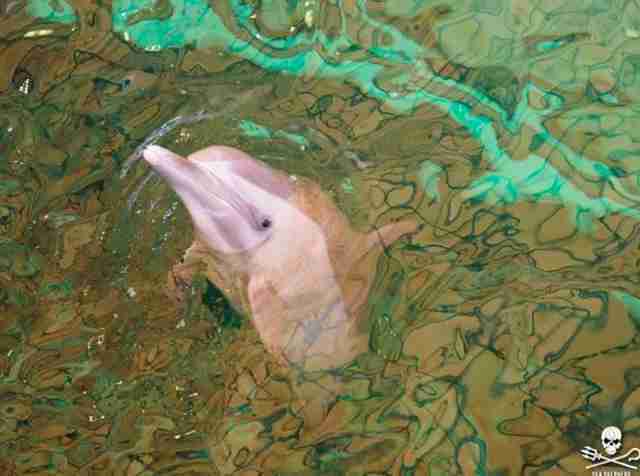 "It's utterly heartbreaking that these dolphins are kept in these tiny tanks," Treverton said. 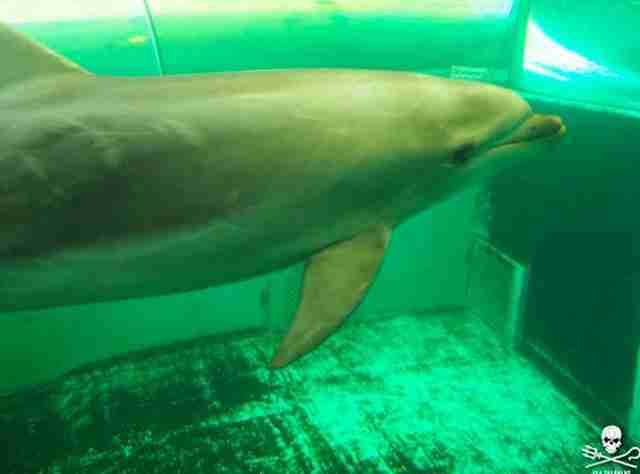 "Never ever visit a dolphinarium or swim with dolphins. If people stop attending, this industry will end." 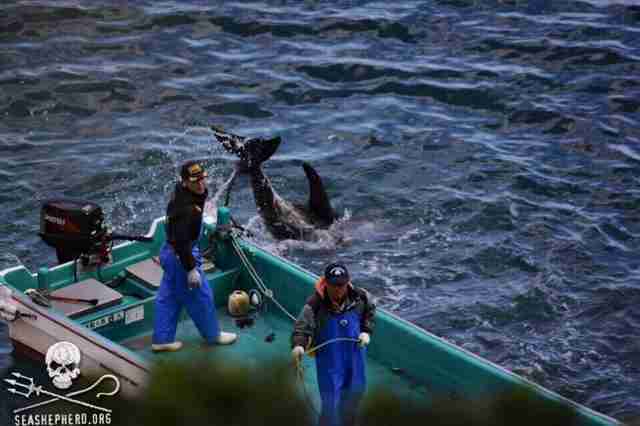 To help Sea Shepherd continue to monitor Taiji, you can make a donation here. You can also visit the group's website to find out more about how you can stop the dolphin hunts, or click here to sign a petition against the hunt.